The 2015-2016 academic year will offer a number of opportunities for Rice faculty, students and staff (as well as other folks in the Houston area) to explore digital humanities. Check out upcoming lectures, gatherings, meet-ups and workshops. One of the great ironies of today’s era of “smart” devices and supposedly soon-to-be-life-threatening artificial intelligence and all the rest is that computing is actually pretty stupid. Smart TVs, doorbells, thermostats, and related gizmos promise us the ability to control our lives from our smartphones. The only thing they fail to explain is why we’d want to do that. Computational life today is less and less about the operation and use of computing devices, and more a new type of lifestyle we live inside computers. Is it a lifestyle we wish to live? A good question. An even better one: what do we do about the fact that it’s coming one way or another. 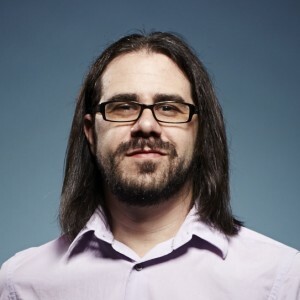 Dr. Ian Bogost is an author and an award-winning game designer. He is Ivan Allen College Distinguished Chair in Media Studies and Professor of Interactive Computing at the Georgia Institute of Technology, where he also holds an appointment in the Scheller College of Business. Bogost is also Founding Partner at Persuasive Games LLC, an independent game studio, and a Contributing Editor at The Atlantic, where he writes regularly about technology and popular culture. Stay tuned for other lectures in the Sawyer Seminar series, including Aaron Jaffe (October 22) and Jon Voss (November 5 & 6). This academic year Rice is fortunate to host two postdoctoral fellows whose work is relevant to digital humanities: Alex Tarr (Mellon Postdoctoral Fellow in Spatial Humanities) and Rex Troumbley (John E. Sawyer Seminar Postdoctoral Fellow in the Humanities Research Center). Dr. Tarr and Dr. Troumbley will give short presentations about their research, followed by discussion and treats. Share your work in data science and network with colleagues. Data science is relevant to almost any discipline; it involves extracting knowledge from data, such as collections of novels or historical documents, spatial information, or social networking data. This events aims “to initiate conversations and collaborations that will position Rice to seek additional funding for research and scholarship as well as create partnerships that will explore new educational offerings.” Humanities and social sciences researchers are encouraged to participate. Please see http://dsmeetup.rice.edu/ for more information, including a registration form. One of the major components of research is collecting and understanding data. In the past, this was primarily a concern for the sciences, but as the so-called Information Age continues to produce vast amounts of knowledge, the ability to acquire, ‘clean’ and synthesize data becomes a necessity for researchers of all disciplines. This short course presents a beginner-level introduction to such techniques using Open Refine (formerly Google Refine), a powerful open-source tool for cleaning messy data. Drowning in data? Not sure how to organize and back it up? This hands-on, interactive workshop will share tips for effectively organizing, documenting and storing research data. Participants will walk away with ideas for completing a data inventory and data storage/ backup plan for their own data. Rev 9-3-15: Added missing date. This entry was posted in Home and tagged events, gatherings, lectures, training. Bookmark the permalink.